Organic farming and food products is not a fad, but a way of life. It is a drive towards creating an awareness for healthy eating and a healthy lifestyle. If you’re wondering from where you can procure fresh organic farm produce in a city like Mumbai, we recommend you visit the Farmers’ Market, an initiative started by Kavita Mukhi. Kavita Mukhi, a journalist by profession, holds a Bachelors Degree in Business and a Degree in Natural Nutrition from America. She went on to teach the subject before starting an organic business called Conscious Food in 1990 which she formerly owned. Organic farming and way of living is much more than just choosing what to eat, it is a cycle of life not only for us, but for the farmers as well. Being brought up on a farm in Uttar Pradesh for the first six years of her life, Kavita realized the potential of fresh produce way back in 1990 when the concept of Organic Farming was still new. “In 1990 when I started the first organic store I knew people wanted fresh produce too. Having lived in countries where farmers’ markets were part of my life, I just wanted my city to have one. I have also been responsible for the Masanobu Fukuoka’s first ever visit to Mumbai which left a deep impression on me.” The late Masanobu Fukuoka is the famed Japanese farmer known for Natural Farming techniques and techniques of re-vegetating deserted lands. 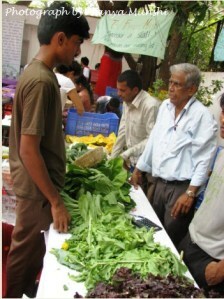 The Farmers’ Market was first launched in Mumbai, on 21st March, 2010 on the day of the March Equinox. ‘This date signifies the beginning of spring, which is good for the farmers, so that’s why we chose this date,” says Kavita. The March Equinox signifies the beginning of autumn in the southern hemisphere and the beginning of spring in the northern hemisphere. The word ‘equinox’ also means equal duration of day and night as the sun crosses the equator. Maybe the March Equinox symbolized a certain degree of equilibrium in our lives where we must strive to achieve through a balance of what we eat and how we live. She also mentions that the scare of genetically-modified foods and the Biotechnology Regulatory Authority of India (BRAI) Bill that was introduced in August 2011, is a threat to food safety, security and freedom – that is another catalyst for the need to go organic and natural. 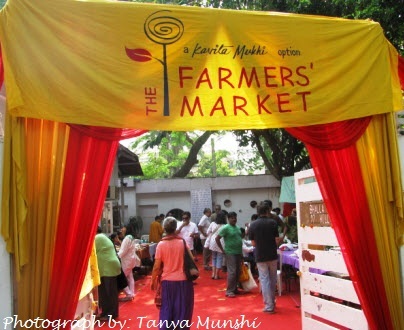 The Farmers’ Market is hosting its third season in Mumbai and the popularity steadily growing. They usually take breaks during monsoons and are back with fresh organic garden produce every year. 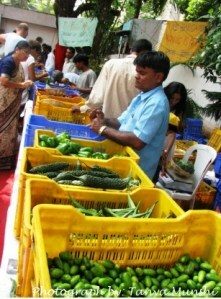 The Famers’ Market is open on all Sundays starting October 2011 until April 2011. The market is held at two main locations in Mumbai; from October and November, you can find the Farmers’ Market at Bhalla House, 97 Hill Road in Bandra West and at Turf Club, Mahalaxmi Race Course, from December to April. It is usually a full day affair from 10am to 4pm, so it is an ideal way to spend a Sunday with family and friends and indulging in some of the niceties of life, guilt free. The farmers are not charged anything for putting up their stalls. 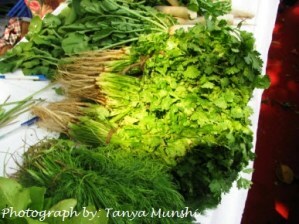 In fact, the Farmers’ Market provides them with tea, lunch and coffee and no commissions are charged from the sellers. The Farmers’ Market regularly conducts workshops and lectures on organic and natural farming. There are several NGOs that are part of the market as well. Several schools and colleges regularly bring their students to the market. One can also find celebrities who frequent the Farmers’ Market on Sundays, eat at the cafe, buy fruits, vegetables and other organic and natural products that are on sale. The good work is gradually spread through flyers that are sent to old customers, posters, Facebook and advertisements on taxi-cabs. Today, it is still a challenge to create awareness to a larger audience with lack of surplus funds. Some of the main produce to look forward to at the Farmers’ Market are fruits and vegetables that are brought in by farmers from Nashik. The Farmers’ Market also includes other farmers and companies who sell non-perishables organic produce. The Famers’ Market is open to anyone who is interested in joining the natural and organic movement. While you can buy natural and organic products, food and non-food items, you can also have a taste of the organic cafe with music and relish the happy ambience that the Farmers’ Market has to offer. Pamper yourself to a foot massage, participate in workshops, watch films, and catch up with all likeminded people who are a part of the market. 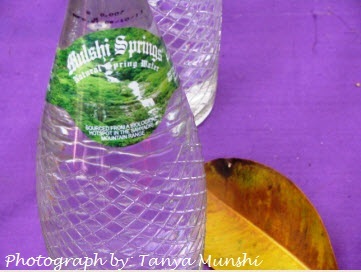 Kavita shares five easy tips to imbibe a natural and a healthier lifestyle. 1) Visit the Farmers’ Market and organic markets in your city and buy more of organic produce. 2) If possible, grow your own veggies in your kitchen, balcony or terrace. 3) Segregate waste and compost the bio-degradable ones in your garden. 4) Rely less on allopathic medication. Go natural as far as possible – try homeopathy and naturopathy. 5) Share organic thoughts and views that will spread organic awareness and a healthier way of life. 6) Be active physically and mentally, that will help you to be happy and spread cheer. Kavita states five reasons why one should go the organic way. 1) For the health of the soil. The less we tamper with the natural soil content with pesticides and chemicals, the better and healthier we live. 2) For the sake of carrying on our farming tradition and keeping it alive. 3) For our family’s health, safety and hygiene. 4) For our food security and freedom. 5) Because it tastes delicious! 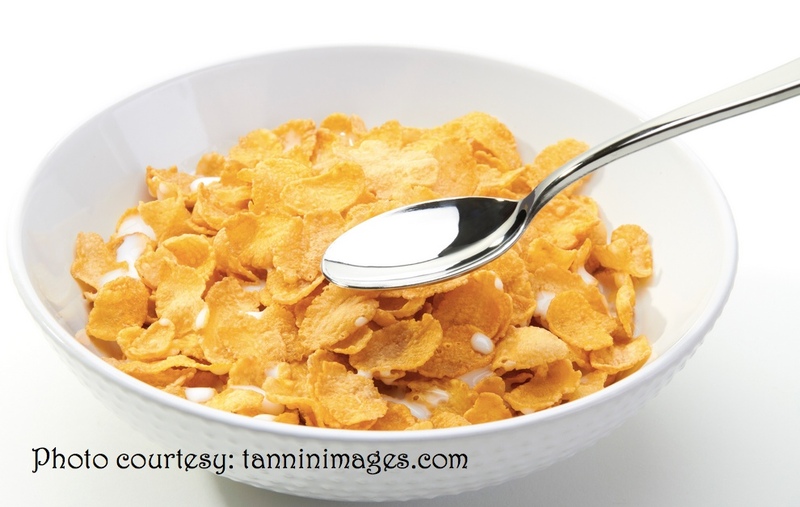 1) We consume white, refined sugar instead of jaggery or the delicious organic sugar. 2) We cook refined white rice instead of whole unpolished brown rice. 3) We make white refined flour bread instead of whole meal breads, our Indian rotis being the best unleavened kind. 4) We add refined iodized salt instead of whole sea salt and rock salt (saindhav). 5) We cook with refined oil instead of cold-pressed cooking oil (our traditional ghani oil). 6) We buy foods without checking their ingredients. We must always choose natural and organic food products. We visited the Farmers’ Market in Bandra on a Sunday and were overwhelmed with the entire experience. We not only picked up farm fresh organic produce, but we also bought organic ghee from Govind Dairy, that has come all the way from Satara district of Maharashtra. We relished organic ice golas, and bought Gandhi cloth bags as well. You can learn how to use a Charka to weave khaadi, which they claim is a soul cleansing experience and buy eco-friendly mosquito repellents made of dried cow dung cakes. You can also treat yourself to organic tea, coffee, vegetable pulao, sightless foot massages or buy organic food mixes, organic pickles and preserves and organic bottled mineral water. So the next time you’re in Mumbai and haven’t visited the Farmers’ Market yet, it is a good way to spend your Sunday with your family, friends and kids and learn a whole new way about organic life and healthy living. If you have a similar organic farmers’ market running in your town or city, do write in to us, sharing your experiences along with photographs clicked by you and send it to tanya@tanyamunshi.com and we’ll be happy to publish it! Very good work Madam, I got to know about the Farmers’ Market just today, please inform me when the next market will take place. I will definately visit this place. thank you so much. The Farmers’ Market usually put up stalls every Sunday in Bandra and Mahalaxmi. But before you go please write to them from http://farmersmarket.co.in/ or contact them from their Facebook page about the latest timings and venue. I am a farmer and I grow totally organic foods, fruits and vegetables in my farm in remote village from mumbai. For selling I need a market. Will you help me? Wow, that’s fantastic! We’d love to know more about your organic farming. I am Jaywant Patil, practicing organic farming from last couple of years near Shirur, Pune, Maharashtra. Currenly, I am into vegetables. Slowly, few of the farmers from my village are willing to change their farming techniques to organic with forming a group. major concern in front of organic farmers is reliable and sustainable marketing channel. We have been duped by various contract farming companies. Please let me know, apart from farmer’s market, if you have plant to scale it innovatively. I have few ideas, which I need to discuss/validate with likeminded people. let me know if we can meet and discuss about the same. I am looking forward to discuss the way forward with you in detail. Awaiting your response. We wanted purchase vegetable can we get the contact details of the concerned person. We are Happy to Let You Know that we have 100% Organic Vegetables and Fruits and we are ready to delivered at your place , Contact Details is mention below . Thank you for writing to us, could you please send us an email with all the details to tanya@tanyamunshi.com. Is there any way to get any of the farmers contact numbers as I find it difficult to travel till Bandra…..Or can they deliver things at my home???? Will the farmers market be there tommorrow and where?? We are new company based from Mumbai. Just started organic farming in Jalgaon District, Maharashtra. Many farmers already doing organic farming over there, but they are not able to market it properly. Interested to meet you regarding marketing. Kindly give appointment . Waiting for your reply. Thank you for writing to us. We’ve forwarded your request (copying you in the email) to Kavita Mukhi of Farmers’ Market. Hope the reference helps you out. rates very low as regular veg.